VS1063 is an easy-to-use, versatile encoder, decoder and codec for a multitude of audio formats. They can be hard to get hold of but we've got them! The VS1063 contains a high-performance, proprietary, low-power DSP core as well as ROM memory, 16KiB instruction RAM and up to 80 KiB data RAM for user applications running simultaneously with any built-in decoder! There's built-in serial control and input data interfaces, up to 12 general purpose I/O pins, a UART, as well as specialized peripherals like a high-quality variable-sample-rate stereo DAC and a stereo ADC, followed by an earphone amplifier and a common voltage buffer. VS1063 can act both as an MP3 decoder or encoder slave IC in a system with a microcontroller, or as a stand-alone circuit that boots from external SPI memory. Note that the description of this chip is wrong. It does not support any MIDI functionality. From the datasheet "VS1063a is a pin-compatible alternative for VLSI Solutionâs VS1053. It has all the func- tionality of VS1053 (except MP1 and MIDI decoding)"
Also, VS1103B is not described as having midi, but it does. VS1103B is capable of MIDI playback while decoding audio files simultaneously. Can anyone tell me what size these pins are? I have a micrometer I could measure it with, but its in the garage and its cold out. 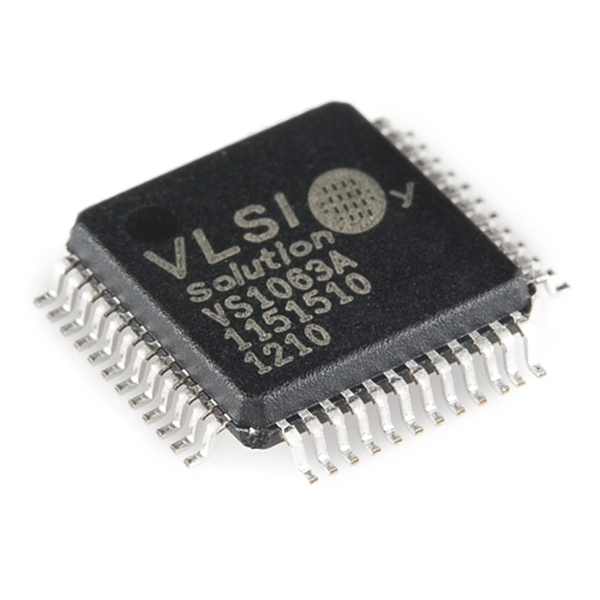 Further Description VS1063a is a pin-compatible alternative for VLSI Solutionâs VS1053. It has all the functionality of VS1053 (except MP1 and MIDI decoding) and many new features, particularly MP3 and Ogg Vorbis recording. So...great chip, but no MIDI functionality despite the byline. I want you all to be forewarned at how cheap SFE has gotten is on shipping this IC. I ordered 4 of these along with 2 BOB-11684 boards. They arrived today in a tiny 5 x 4 x1.5 box. Each IC was in it's own super thin bag. So thin that i could chew it and swallow without a problem. You cannot package a IC like this in just a bag, The leads will bend. To shove 4 IC's 2 BOB & paper packing all into that little box is just flat out dumb. Now i have IC's with bent pins. SFE, stop being so dam cheap. Invest in anti-static foam boxes like everyone else does. You're not a company hurting for money, and you already charge far more to ship than most others, there is just no good excuse you can have do doing something as pitiful as this. MP3 encoding requires some license - this is included with the chip, right? On the vlsi site it says the price includes encoding license, so can we assume those chips also have it? This is the right part, and yes it can be done. You have a good chance of success assuming this was the only part that was damaged. Good luck! Any chance of these coming back in stock soon? Wow that's cheap! This chip is supposed to be the vs1053 on steroids, but half the price? Now how about a breakout board? (Or just sell me the 1053 board without the chip on it for $20 less, and I'll solder it myself). Where does the price difference come from? From my understanding the other VS10xx ICs have a recommended retail price of $20 (set by VSLI? ), but sparkfun gets them for alot cheaper, this is why the breakouts were also $20. They must have lowered that for these chips..